March 12, 2018 March 4, 2018 / Elizabeth T.
Can you believe it’s already March? I can’t believe how fast time flies! It’s almost officially the start of spring! And with the start of spring, it’s also the unofficial start of music festival season! If you’re a follower of music festival style, then you know these extravaganzas are always so inspirational when it comes to fashion! There’s nothing I love more than the abundance of street style, but what always wows me the most are all of the ensembles that exude that perfectly effortless bohemian chic vibe! Though the layers of lace, loose-fitting layers, and embroidered details may look complicated and difficult to style, there’s actually a super easy formula to achieving a bohemian chic look that works perfectly for festival season, transforming you in to a desert princess! Read on to see my four festival season essentials to achieve an effortlessly chic music festival ensemble! 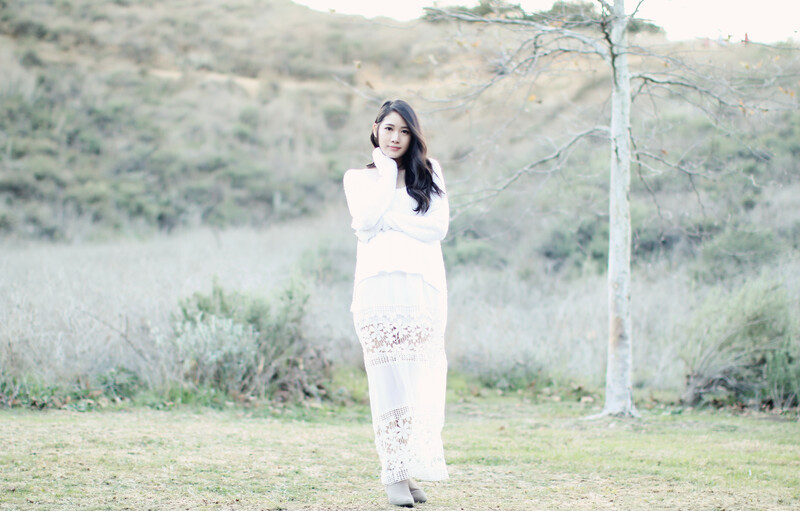 There’s nothing more beautiful that embodies that bohemian chic vibe than a white lace maxi dress, don’t you agree? There’s just something about the light color palette, lace details, and flowing silhouette that makes you look and feel so whimsical and dreamy. Since you’ll be out in the sun all day, it can get quite warm during music festivals, but at the same time, the deserts can get quite chilly during the night. While it may definitely be smart to pack a jacket, it can be inconvenient to carry it around in your hands while you’re out enjoying the music and dancing away. That’s why I find a loose, off-shoulder knit sweater to be the perfect layering piece because it’s cozy enough to keep you warm, but at the same time, the looser silhouette and off-shoulder fit really helps you breath throughout the day! There’s nothing worse than trudging through grass and dirt with uncomfortable shoes, am I right? This is why, instead of opting for high heels, I like comfier options, such sandals, sneakers, or ankle boots! While sandals are easy to get around in and sneakers are super comfortable, there’s nothing quite like suede ankle booties because they not only add a little extra height, they also fit that bohemian look so well, don’t you think? Plus, they look great with not only shorts and jeans, they’re also super cute with skirts and dresses, making them the most versatile shoe option (which means you’ll also be able to save space in your overnight bag)! And of course, last but definitely not least, is a small cross-body bag! While a bigger bag can help you fit all of your belongings in to one place, it can become quite inconvenient, especially when you’re walking from one stage to another. That’s why I always opt for a small cross-body bag to hold all of my essentials. Not only is it so easy to carry around, due to its smaller size and lighter weight, cross-body straps also ensure that your bag will stay close to your side, so you won’t have to be afraid of people accidentally taking your bag! What’re some of your favorite essentials for festival season? Let me know in the comments because I always love hearing from all of you! Love the lace details ! Perfect look for festivals ! Thank you so much love ❤ 🙂 Lace is one of my favorites! Thank you so much love ❤ 🙂 It's actually a maxi dress! Thank you ❤ 🙂 Thank you so much love! love this lace outfit…so feminine and beautiful!!!! Such a cute look! Love the photos! Oh how I LOVE this all white, super muse-y look!! I am never one for music festivals but I would totally rock this outfit. 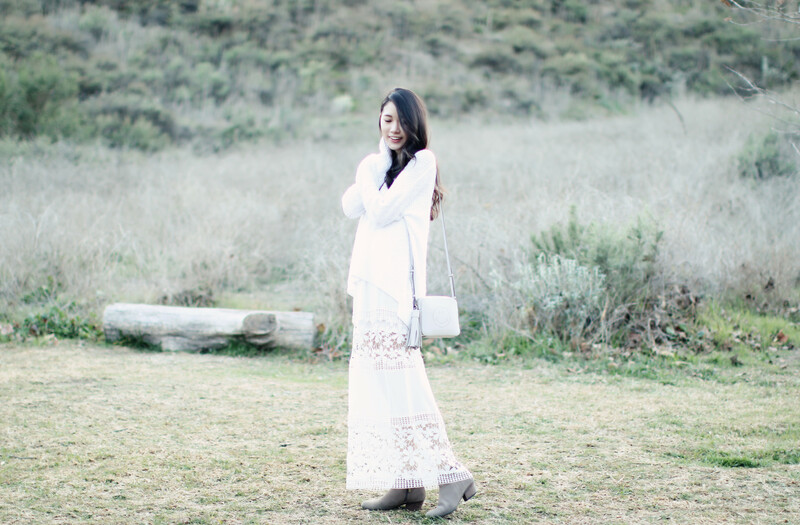 I’ve been meaning to try the maxi dress under loose sweater look. You totally mastered it here! Aww you’re too sweet babe! ❤ 🙂 Thank you so much! 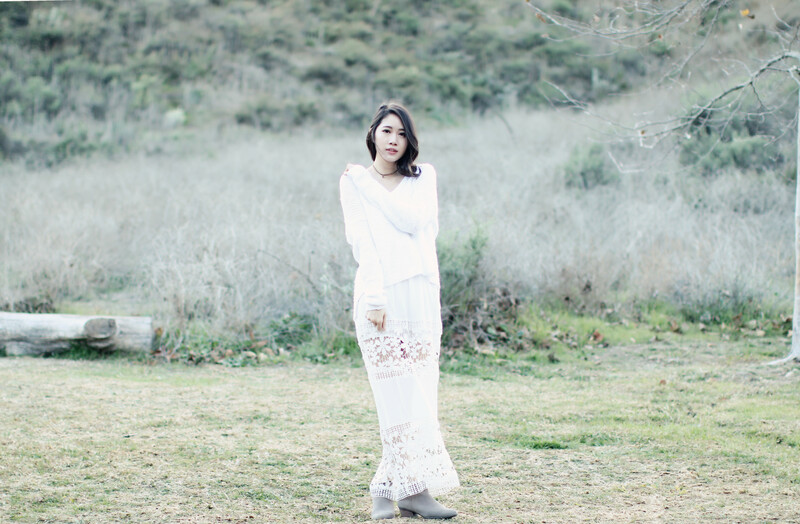 And yes, the maxi dress under a loose sweater look is so wearable! Plus, it's super cozy too! Love this oh so dramatic photo. The lace dress is so chic. The bohemian look really suits you!! And I love the shooting location, so beautiful! Thank you so much Tiffany ❤ 🙂 I've been obsessed with bohemian looks lately too! 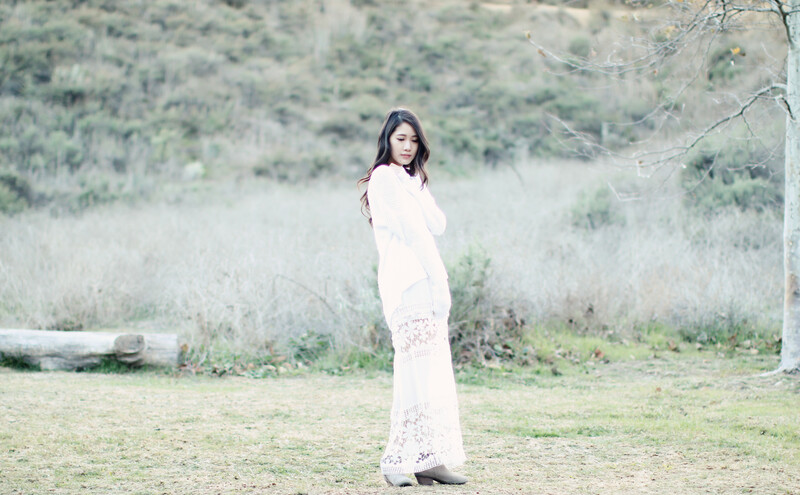 The white lace dress looks amazing on you! I always love wearing white dresses during the summer time. Big YES to that dress! Love the look! Oh yayy I definitely agree on all those essentials! Now I can’t wait for festival season 🙂 Have a great weekend dear! I love it!! I definitely need to get some more white dresses in my wardrobe! Excited for festival season, and couldn’t agree more on your list of essentials! Are you going to any this year?? I’m so excited for all of the fashion inspiration too! Unfortunately, I don’t think I’ll be able to this year 😦 Are you going, love? Give me all the boho lace dresses!! great post and perfect festival essentials for sure! love how your photos are shot as well…dreamy vibes! I’ll second the ankle boots! These photos are so whimsical girl! I love your edit on them and so totally excited for the spring! Spring has arrived and there are so many exciting stuff to do. One of them is attending festivals. I guess you have to be ready with your festival chic look because it’s on. You look amazing! Love the lace dress! Festival season is my fave! Mine too! ❤ 🙂 The fashion during this time is amazing! Love your outfit! This would be so perfect for a festival! Great choices! I love that lace dress! Thanks babe ❤ 🙂 That lace dress is my favorite! Such an amazing outfit! Perfect for spring festival! Thank you so much love ❤ 🙂 Bohemian looks are my favorite for festival season! The dress is gorgeous! I agree with your list. I think very soon we’re going to be looking at the end of December again! Time does fly these days! Love your picks for the festival season! I’m super kicked for Coachella this year, it’s my first time there! Yes, time really passes by sooo fast now!